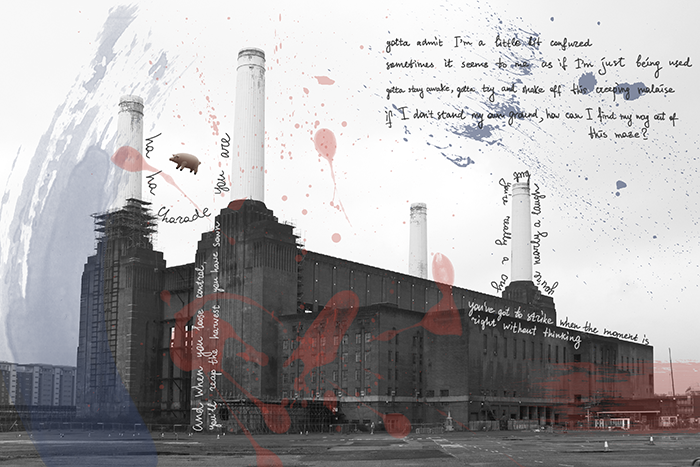 Inspiration – Pink Floyd – Music. Lifestyle. Travel. Music is the greatest inspiration for my art and for my life in general. I get things done with earphones, I overcome difficulties. Once I wrote in my twitter account: “Listening to the right kind of music, helps to overcome all existing problems in accomplishing your aims.” I do believe that is exactly how it works. I can’t even describe what Pink Floyd means to me, it connects to my soul, changes the chemistry of my brain, it gets me high, my mind flies into space and then I create without thinking. The picture above has been created while I listened to the “Animals” album. I’m happy to say that the original photograph was made by me, 3 years ago when I visited London. I could not resist to see the Battersea Power Station with my own eyes and I was lucky to have seen it before all the reconstructions began. In the near future I’d like to print the picture in a very big format and manually put colour splashes and writings over it, in other words, reproduce everything that I did already in the digital version, manually.